In this work, magnetically separable ZnO-ZnFe2O4-PPy nanocomposite as an efficient adsorbent was synthesized by two steps. At first, zinc oxide (ZnO) and ZnFe2O4 nanoparticles were synthesized using simple and facile precipitation method. Then, ZnO-ZnFe2O4 mixed oxide was modified by polypyrrole (PPy). The adsorbent was characterized by X-ray diffraction (XRD), Fourier transform infrared (FT-IR), UV-Vis and scanning electron microscopy (SEM). The synthesized nanocomposite were used as adsorbent to remove Congo red dye from aqueous solution and were compared with pure ZnO and ZnO-PPy adsorbents. 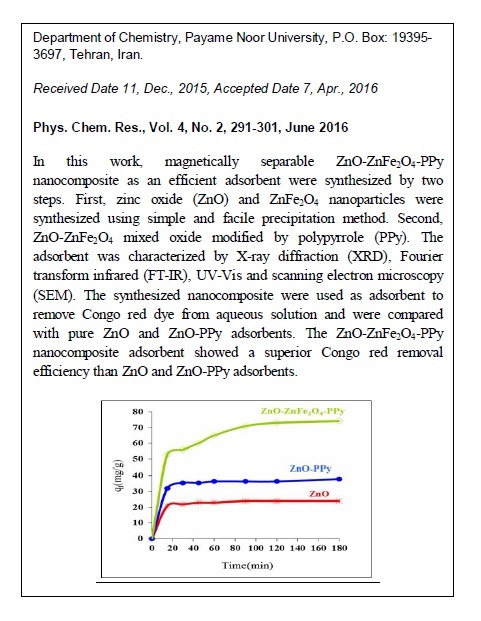 The ZnO-ZnFe2O4-PPy nanocomposite adsorbent showed a superior Congo red removal efficiency than ZnO and ZnO-PPy adsorbents. This efficiency is attributed to the charge of surface obtained in nanocomposite adsorbent. Furthermore, the adsorption kinetics of Congo red onto the nanocomposite followed by the pseudo-second-order kinetic model.